Is there a labor shortage in the U.S.? Employers are shouting “yes.” Economists keep looking for wage increases as evidence of a labor shortage, and since wage increases are still relatively modest, the argument that there are severe labor shortages in parts of the U.S. is unpersuasive to many conventional economists. Michelin – $16.50 & up to start, depending on experience. Greenville Tech (vo-tech school) – recruiting students for master welding classes, you can make $80K w/ 5 yrs experience. 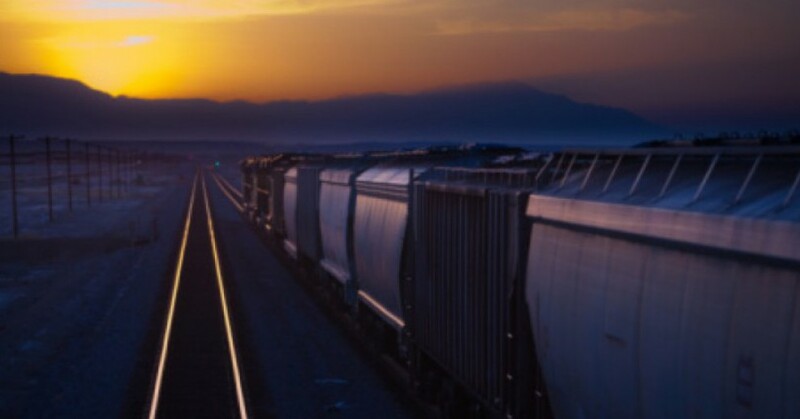 every trucking firm & almost every business has a banner in their front yard saying “WE’RE HIRING”. 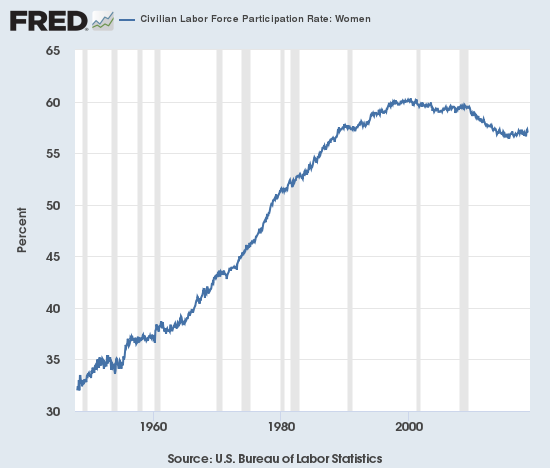 Let’s look at the labor participation rates for the populace at large, women and men. 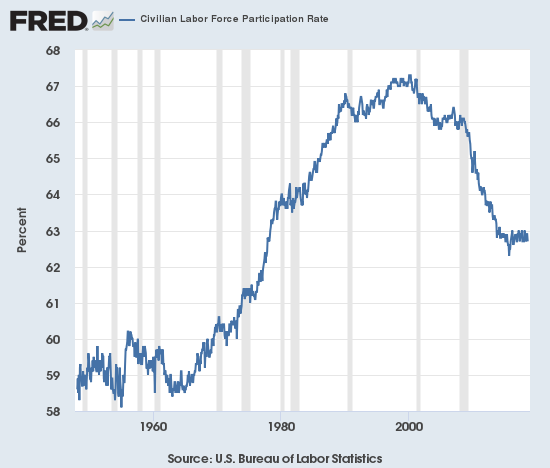 The labor participation rate reflects the percentage of the population that’s in the workforce, either working or actively looking for work. 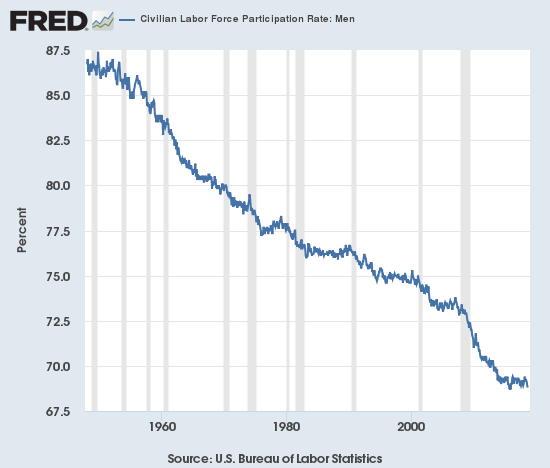 It’s hard to find statistics for many of the dynamics behind the sharp decline of male participation in the official workforce, as few institutions track such trends such as the number of men making a living in the black market. It’s hard to estimate this number and hard to get those engaged in the black market to answer honestly to questions about activities that break laws requiring the reporting of all income, regardless of source. 5. Misplaced sense of pride / dignity. Many tradecraft jobs (welding, construction, etc.) have traditionally provided male workers with strong identities and sources of pride and dignity. That even these jobs are going begging suggests the possibility that at least some males no longer gain the pride / dignity they desire from work, or they’ve surrendered the desire for earning pride / dignity in the workplace: work is for chumps,etc. American life, the inconvenient realities may upset somebody, so better to stick with magical-thinking or politically-correct truisms that are completely out of touch with reality but oh-so-acceptable to the status quo. Maybe it’s time for a real discussion of work and employment in a system dominated by mobile capital and self-serving insiders. This entry was posted in Business, Economy, Government, Labor and tagged Labor shortage. Bookmark the permalink.